Garden lighting is one of those jobs that can transform your outside spaces. With the Advancement of LED lighting the choices we have of different types of low energy garden lighting or huge. Firstly how will we control the lights? Timer, your garden lighting will come on and go off at preset times. Remote control via an app on your phone from anywhere in the world. 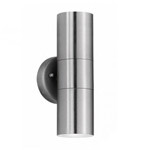 Wall mounted lights are the most common and the least problematic. When I say problematic I mean that if the installation of your lighting isn't carried out correctly by a skilled electrician then you are bound to encounter problems. Wall mounted lighting will throw up the least problems for you. 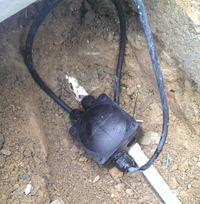 However, installation of patio floor lighting can be extremely problematic if not carried out by a skilled electrician. We need to remember that if there is a way into something, then rain water will find it. 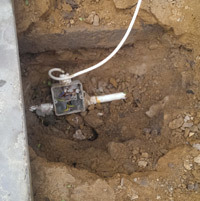 Below is a photo from a job we got called to. A family had recently spent over £100k on a beautiful extension to their family home. To finish of they had a lovely patio laid using Indian sand stone. As a nice finishing touch they had 100mm recessed LED lighting installed around the perimeter. First mistake was the outside lighting was coming off of the downstairs lighting circuit. 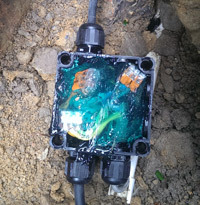 It is always best practice wherever possible to keep outside lighting on its own circuit. 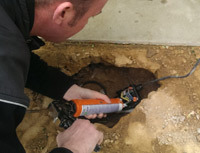 If you develop a fault outside you don't want to lose your indoor lighting too. Second mistake, ummm, well, just about everything really. The material selection is all wrong and the worst mistake....... There was a junction for each light, under the actual patio. We felt terrible but we had to rip the patio up to put this job right for the customer. 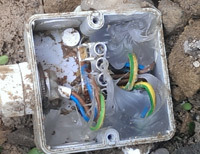 We wanted to completely rewire and do the job properly but due to costs and time the customer requested that we repair the connections in their current location as best we could. It's been 2 years since and no problems so far. Garden lighting is important especially at this time of year we are happy to come and advise on best practices and solutions to light up the dark parts of your property through the darker months. Just taking the bins out can be a task without correct lighting in winter.